The Bible is inspired and inerrant. Hermeneutics rooted in grammatical-historical method. Promise Theology. Expository preaching-Exegetical Theology with the meaning and message of the Biblical text. "Keep your finger on the TEXT!" Thank you for stopping by Walter C. Kaiser Jr.’s website. This website has been created in order to help people who might be interested in finding out about what Dr. Kaiser has written, or for those who are interested in contacting Dr. Kaiser to speak or to contribute something in a writing project. You will find an up-to-date bibliography of Dr. Kaiser as well as a shorter list of his major contributions in monographs. We will also to post a calendar of Dr. Kaiser’s speaking schedule. This changes often though and probably won’t be as up to date as we’d like! The staff here at Kerith Farm does its best to keep up with him, but he seems to always have a lot of things going on at the same time! 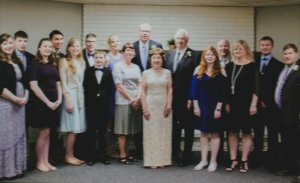 Spring 2017 Dr Kaiser married Nancy Veldbloom. When not on the road speaking, the happy couple reside in Oostburg, WI.